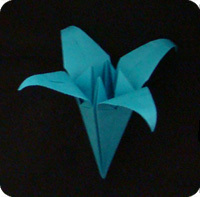 The origami iris (also called an origami lily) is a traditional design loved by many. 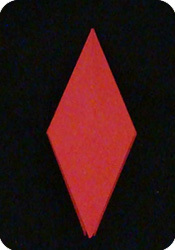 The folding sequence is considered “intermediate” in difficulty. 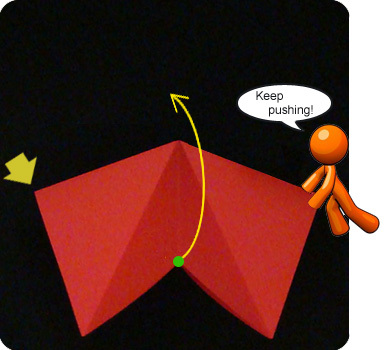 It is not a hard model to make, but there are quite a few steps to follow. 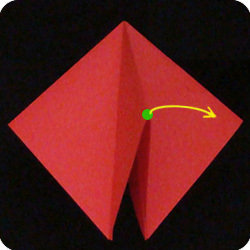 Many of the steps are repeat-on-the-other-side types of fold. Because there are so many repeated folds, it can get confusing. 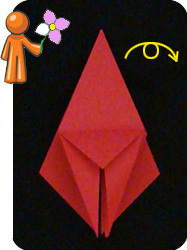 The thing to remember with this origami iris is that there are 4 petals, so the folding sequences need to be done 4 times. 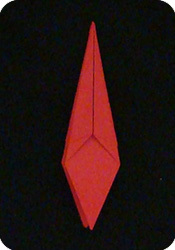 If you find this model too difficult to complete, try the day lily which is easier and looks quite similar. 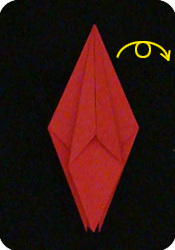 Shown on the right are three origami iris flowers. 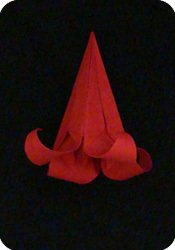 They are all made the same way, the only difference is how much the petals are rolled back. • The yellow flower has petals which are just slightly pulled back. • The blue flower has flared petals, only the tips are curled back. 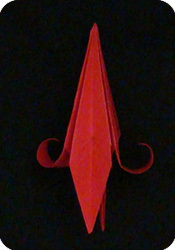 • The red origami iris flower has petals which are curled the most. 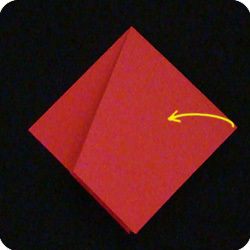 Start with a square sheet: fold and unfold the paper along the diagonals (in both directions). 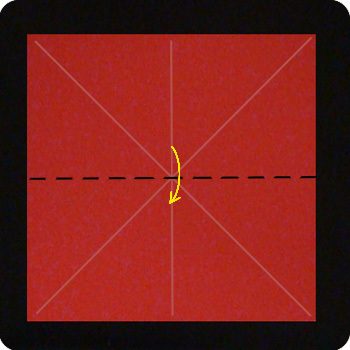 This gives you an “X” shaped crease. In this example, the paper is the same color on both sides. 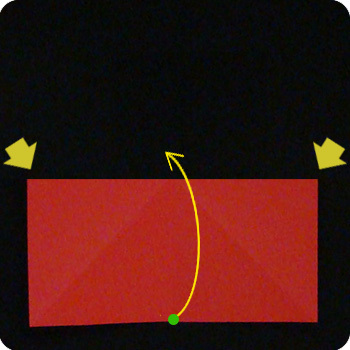 If you are using paper which is white on the back side, then start with the colored-side facing up. Watch the movement of the green dot. When done (see next photo), you will get a square shaped piece of paper that is a quarter of the size of the original paper. 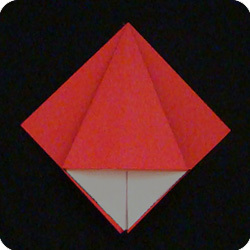 This form is called a “Preliminary Base” and it is commonly used in the making of many origami models. We will make a “squash fold”. 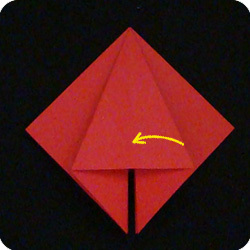 First, lift the right-flap of paper back up towards you. 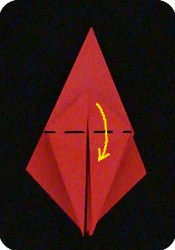 Pry open the two layers of paper and press down (squash the paper flat). 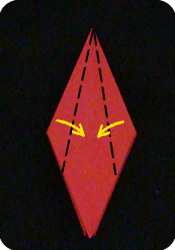 Repeat the squash fold. 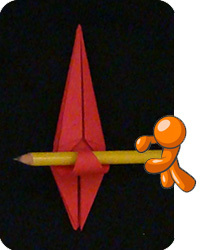 First, lift up the right-flap. 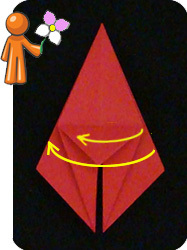 Note: If you used paper that is white on one side and colored on the other side, the model would look more like the one on the left. Some of the white is showing. Like turning the pages of a book, swivel the squashed-flap from the right towards the left. Time to do the third squash: lift the right-flap up. This is how the model should look like. Turn the model over. 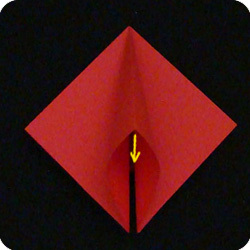 Perform the final squash fold: lift the right-flap…. 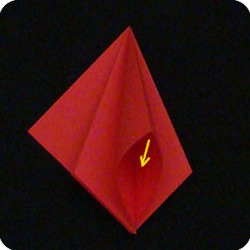 …pry open the layers and squash the paper down. 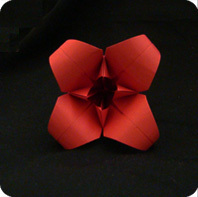 Now we start the four “Petal Folds”. First, fold the bottom-left and bottom-right edges of the paper towards the vertical crease . Lift up the top-layer of paper (green dot). 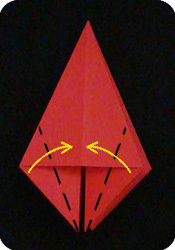 The sides of the model will fold inwards because of the creases made in previous step. 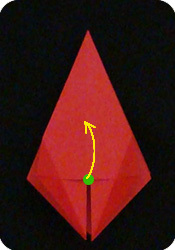 Keep lifting the paper up at the green dot. 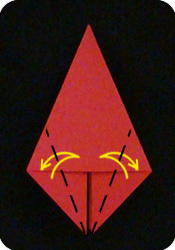 A new triangular flap is made; fold down this small triangular flap. 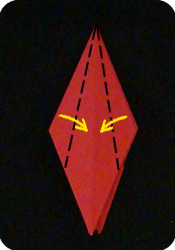 Turn the model over and get ready to repeat-on-the-other-side. Fold the bottom-left and bottom-right edges of the paper towards the vertical midline as shown. 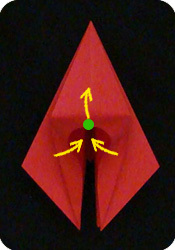 Lift the paper at the green dot. 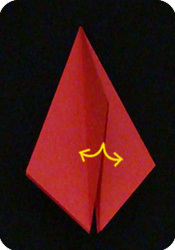 The sides of the paper will automatically fold inwards. Fold the triangular flap down and you’re done the second petal fold. Two more to go. 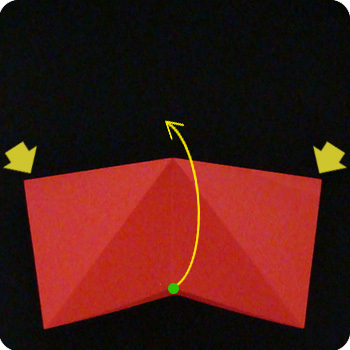 Like turning the pages of a book, turn two flaps from the right towards the left. Do the same at the back side of the model: turn two flaps from right to left. Time for the third petal fold: fold and unfold the bottom-left and bottom-right edges of the paper towards the central midline. Lift the paper at the green dot and allow the sides to fold inwards. 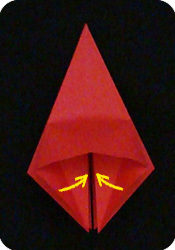 Fold the triangular flap down. 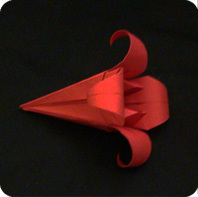 Turn the model over for the last petal fold. 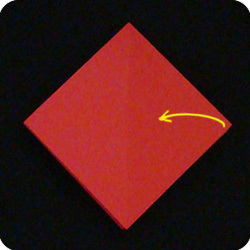 Like turning pages in a book: swivel one flap of paper from the right towards the left. At the back of the model, swivel one layer from right to left. 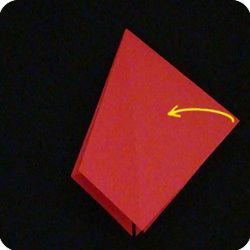 This is how the model looks like. The next few steps will make the “tube” part of the origami iris flower more narrow. 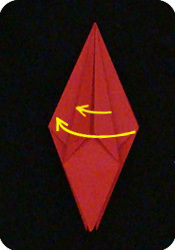 Fold the top-left and top-right edges of the model towards the center. 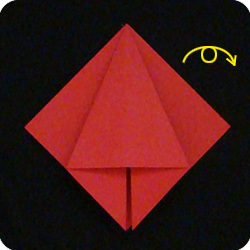 Repeat the narrowing process: fold the top-left and top-right edges towards the center. 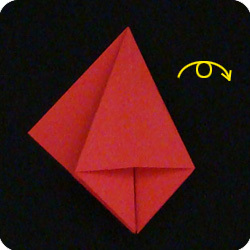 Repeat: fold the top-left and top-right edges to the center. 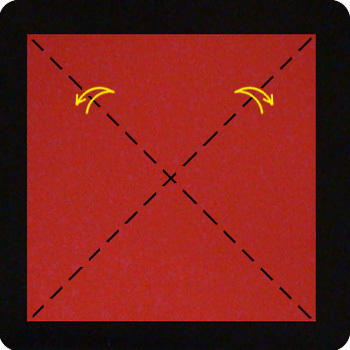 For the last time: fold top-left and top-right edges to the center. The model is looking pretty narrow! Time to curl the petals. 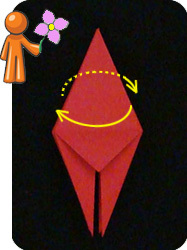 Wrap the bottom flaps of paper around a pencil to curl the petals.